Last week when America’s Quarterback, Pro Bowler Jameis Winston, was cruising through radio row at the World Congress Center in downtown Atlanta, one of his pitstops was an appearance on CBS Sports Network during a broadcast of the Tiki and Tierney show. 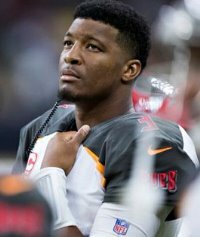 It was there, Jameis got ever so slightly emotional when discussing his suspension over the hassle with an Arizona Uber driver, which cost him the first three games of the season when he had to stay home and stay away from One Buc Palace. During his exile, the Bucs were 2-1 and Jameis admitted it hurt him not to be able to share the joys of victory with his teammates. “The toughest thing about that was, I wasn’t there,” Jameis said of the suspension. “Seeing Ryan [Fitzpatrick] have great success, I expected it. He’s a great quarterback in my eyes. But not being part of the team victories [was painful]. Jameis said how the Bucs fans rallied around Fitzpatrick inspired him so much he wanted to wear a fake beard to look like Fitzpatrick. Jameis also said he realized just how much hunger and passion there is with Bucs fans to finally start winning. When asked if those same fans have embraced him as a Bucs quarterback, Jameis didn’t deny there are a number of fans that don’t like him but added if the Bucs can string together winning seasons, those same fans will accept him. You can view the full interview below. And Jameis is right. Winning is the greatest perfume. Eventually you run out of kitty litter and all you have left is a box of $#!t. You got one year Jameis. Prove you are our QB. oar, are you describing your posts? no doubt winston has to play better, make better decisions and keep his nose clean but the former HC did him no favors….no run game…predictable play calling…no defense…no adjustments….the list goes on and on…..
i think winston will learn a lot under byron and bruce which will translate to wins….he may not throw for 5k but his turnovers will decrease and his decision making will get better…. No duthsty, you’re just part of our ignorant fan base that isn’t very good at analyzing football or players and blames the quarterback when it’s evident the run game ol kicking game and defense are far bigger problems. Bruce arians disagrees with you and I’m sorry you don’t know more than Bruce. Scare away Jameis everyone. Then spend another decade searching for someone as good as him. Ruin it for us all. Jameis is going to ball this year then you’ll be quiet. I bet you the commenters here don’t watch the video. Jameis is absolutely right about everything he says. He has to play better, and it’s up to him and BA to use DeSean better and do what they can do. See there’s your mistake, you added a f%#k that I didn’t give. ^^ haha, np oar. Absolutely no f**ks to be given. Thanks…It took a while, but I was able to escape the mothership finally! Great interview. I support you, Jameis. He will be a better player under the new management and put his immaturity woes behind him. And if he doesn’t, he’ll get cut and we’ll go shopping again. It’s not the end of the world. We’re in good hands with B.A. and he has a vision for this team with or without JW. Go Bucs. After being the 1st pick in the draft Winston is rated below average by the nfl and yet …after issues at school, not being truthful to his own team , having issues as a player after 4 years….the excuses continue !!. This is what people said about Josh Freeman, man what a superstar that guy is now! I sincerely hope you’re right. Because nothing in the last 4 full years has indicated that this is going to happen. Meanwhile Bucs fans have to watch guys like Patrick Mahomes, Jared Goff, Lamar Jackson, etc do things like win MVP’s, go to the playoffs, and the Super Bowl in less than half the time Jameis has even been in the league. Hmmm listen to ignorant arse Bucs fans evaluate Winston or BA. The ignorant ignorant don’t even realize their evaluation is irrelevant. He has one year really. So he’s known Winston all these years and people think he has to turn into an overnight sensation in the first year of the offense. Despite the hate I doubt BA took this job at this age to start over with a rookie quarterback. My guess is in a contract year Winston plays just well enough for a second contact which has me laughing at the haters with biased evaluations. That is definitely not true, man. Even a majority of the national analysts would disagree with this statement. He has shown plenty to indicate that he is capable of it. Hopefully this will be the year of doing it full time. Meh. Freeman’s issues were mental. Jameis’s seems to be immaturity. Lazy to compare the two. Jameis has multiple records and accolades to refute your suggestion that he has shown NOTHING. That’s just simply not true. Arians is here to work with UK for a reason. Like I said get the man an average defense and somewhat of a run game and he will blow out Goff Lamar etc. We did have a very good offense. Jameis needs consistency without turning the ball over and he will vault into elite consideration. What do those young QBs you listed have in common? Successful NFL caliber head coaches, competent defenses, great offensive lines, and good running backs. Answer truthfully….has Jameis had those necessities? I’m hardly a JW nuthugger, there are people here who think I hate him. But I liked him the final six games. I want to see that continued…”smart” JW not riverboat gambling JW. I get that if there is no rash of injuries and BA doesn’t have the big one…JW needs to produce this year. IMHO I believe he will. Mr Cliche here will drag out another. “That which doesn’t kill us makes us stronger.” Last year was the worst in JW’s young life. He was totally humiliated…the suspension as he outlined…the rejection and criticism from a significant number of Bucs fans…watching Fitzmagic showing what could be done with this offense…and then a FIRST for JW…getting benched. It was a truly HUMBLING year for him. It didn’t kill him though and I believe it has made him stronger. I’m really looking forward to watching him rebound from all of these challenges this year. So Jameis wants to play great and be loved by Bucs fans. Good! He wins, we win. I just don’t understand the hate. Those among you without sin cast the first stone. All of us have stupid things when we were young. He’s paid the price now leave the kid alone. Good luck Jameis plenty of us out here wish you the best and are totally behind you. Doubt Rog even does an investigation on Antonio Brown. Gotta keep those ratings up right guys? Yes they’re called bandwagon fans. Think he’s a demon now but they will be on their knees thanking God when he is holding up a Super Bowl MVP trophy. Believe me no one is gonna get down on their knees in thanks of Jameis Winston. Truthfully, Jameis has not had those. But as you said we had a good offense, or at least a good offense until we got in the red zone. Among that was one of the very best receiving corps in the NFL. I want to believe that he is just a good QB surrounded by totally bad players but the Cincy game was the last straw for me. The Bengals completely annihalted him but then Fitz comes in and carved up the very same defense that picked off Jameis 4 times. I don’t think Fitz is better than Jameis but come on. Jameis is lauded for his young age and it is constantly used as an excuse for his bad play, yet Mahomes is younger than him and has been in the league half as long and only became the starting quarterback this year. He was practically a rookie. And lost one of the leagues leading rushers in the middle of the season and he went toe to toe with the greatest QB ever and (as Jameis Mob likes to say) put his team in a position to win then his defense succumbed. Now the Chiefs are miles ahead of the Bucs so I don’t expect Winston to go to the Super Bowl any time soon. But you don’t put up 5,000 yards and 50 TD’s just because you’re on a great team. Does that not disappoint you? That a guy like Mahomes who wasn’t even taken No.1 overall is miles ahead of our own No.1 overall pick that’s going into his 5th year? He wasn’t referring to the fan base. He was referring to fans. I’d bet a ton of fans would be willing to do more than just kneel to Jameis if he won the Superbowl. Especially tmax. I mean he already has GMC in his mouth all day. I’m always amazed at the number of Bucs fans that actually hope for our QB to fail. WalkdaPlank…so you’re saying that Mahomes like QB’s are everywhere to be found? I’m sure there’s 25 teams out there that would love a Mahomes. Jared Goff is trash to me. I’m perplexed by the flaws in your logic, walkdaplank. You are speaking about the best first year for a starting QB in history. To insinuate Jameis isn’t a good player because a younger player performed that well is failed logic. With that mindset, Patriots fans should be dissapointed because Brady wasn’t as good as Mahomes. Not to mention KC has a much better ol, run game, and even a better defense considering there’s is still bad. Which speaks volumes about our defense. Not to mention Andy Reid, of which is one of the best coaches in the NFL. Jameis is better than Mahomes. Fire Licht, Mahomes MVP award says differently. Why is @ Robert even still commenting here. Didn’t you say you would leave and never come back if they started Winston last year and say Fitz will start all year? Wrong on all 3 accounts I guess. How can you bad mouth anyone when you don’t do what you say you are gonna do? First off, its Licht. Secondly, if you think Jameis is better than Mahomes, you need to slap yourself in the face right now. Capable and probable are two different things. I would have been more optimistic if he was actually calling the plays. No need to wait, Robert. We will fine with it. There is a spot for you at Joe Pats Fan. Jameis needs to quit talking and go hire a quarterback whisperer. It could help him tremendously. The current training schedule is not going to help him get better, neither will tossing balls to Louis Murphy. He needs to put some money when he mouth is and make people like me eat schnitzel when he can actually put this team on his back and win games. 0-14 on the road is not good enough. Still waiting for Jameis haters to finally make me see the light. They’ve been whining for 4 years now. Yet they’ve yet to change anyone’s mind. I don’t use the lack of running game and virtually no defense as an excuse for Jameis, but they are very telling. The QB’s Bucs fans rave about have good RB’s and solid defenses. That doesn’t seem to faze the ‘haters”. They never come back with anything on that though. It’s as if they know it’s true…. I know one thing if the Bucs trot out this same defensive roster and Peyton Barber at RB, Jameis Winston will be gone from Tampa. Russell Wilson, Nick Foles, Derek Carr, Dak Prescott, Carson Wentz, Mitchell Trubisky, Deshaun Watson, and Baker Mayfield. These are QB’s that I think have shown that they are at least as good as or better than Jameis. And the only one of them who was taken No. 1 overall was Mayfield, who by the way had an amazing rookie year after taking over an 0-16 team who fired their head coach midway through his rookie year, so maybe a QB can look good even his entire team is bad. Also before you bring up Jameis’ “multiple records and accolades” to argue that he is an elite quarterback, just know what you’re talking about. By multiple I assume you mean TWO records. I honestly might be forgetting something but I believe he only holds two records which, by the way, are FRANCHISE records. What franchise are we talking about? The Tampa Bay Buccaneers, one of the most historically worst teams in NFL history outside of a glorious run in the late 90’s/early 2000’s. So what records are we talking about? The most yards and most passing TD’s franchise records. Who held those records before Jameis? None other than the great Vinny Testeverde and the immortal Josh Freeman. Two QB’s that surely make Tom Brady jealous, right? Im not sure about you, but I’m not impressed. The records aren’t meaningless, but it wouldn’t be able to hold a convo when put up against an NFL record. Like if per say, Jameis had the 5th most passing yards in a season or 7th most TD’s in a season. But Jameis can’t even crack a 2:1 TD to INT ratio and you’re treating his “multiple records and accolades” (aka two) like they are some prestigious proof of his elite-ness. Add that among active QB’S He’s ranked #1 pass yds per attempt and completion. And ranked in the top 10 in a few other categories. . Which includes ints and fumbles. There’s room to debate some of the NFL records because of the age qualifier. And there’s only like 9 guys who he is competing with , age wise, for comparison. But that’s not his fault and it’s not a disqualifier that should diminish what He’s accomplished. As far as holding Bucs records…..who gives a sh#t! Every QB you listed is arguably worse than Jameis in many metrics. Most of which have better surrounding casts as well. In nearly every aspect of defense, run game, and offensive line. Nobody is preaching him as a Messiah as much as you are leaning towards the pessimistic perception of him but okay. That’s a whole lot of typing for not even knowing the records I was referring too lmao. But thanks for adding more. He has set records for first QB with 4k yards in consecutive seasons in NFL history. Tied record for consecutive games without an int.Tied most TDs in game with 5 and Jersey is in Hall of Fame. There’s more but if you were a real fan you would know. You can totally do your due diligence on your own now before you try to condescend me again on something you evidently know little about. There is something good for everything bad you can name about Winston. You just decide to focus on the negative and belittle him because he doesn’t match up with an outlier you like Mahomes. So we’re making stuff up now? The NFL record for most TD’s in a game is 7, not 5, but nice try. NFL record for most games without an INT? Winston had 4 his rookie and that is definitely not the record, yet again a nice try, but you failed. Now he DID throw back to back 4K yard seasons, good job buddy, but he was NOT the first person to do it. He was the first person to do it *to start a career*. So congrats you were half right. Any other “records” you wanna make up for Winston? Most consecutive crab legs stolen or “W’s” eaten on the field but not on the scoreboard? Literally every single one of those has to do with age. You say there’s only 9 guys to compete with so that right there takes away from your argument. Good for him that he left college after his sophomore year and found a little success. He had a pretty good rookie year. But those records don’t put him up against any of the quarterbacks considered elite which is the whole point of bringing up the records. I’m not making an argument for Jameis. Just pointing out some of his records. My personal opinion has nothing to do with records or how old he is or the oline, RB, defense, kickers, coaches and the trainers. I don’t look at the wins or losses. I look strictly at how he executes the responsibilities of the position. If your comparing Winston to Mahomes or any other player there’s a few posters who claim you can’t compare or if winston had an entirely new and upgraded position group He would be just as good if not better. That entire line of thinking is just smoke and mirrors. If the conversation was about wins, then it’s relevant. 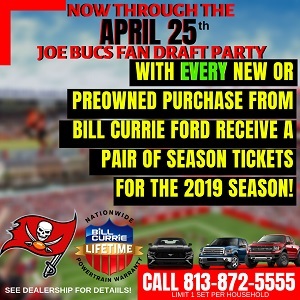 “Jameis didn’t deny there are a number of fans that don’t like him but added if the Bucs can string together winning seasons, those same fans will accept him.”……….uhhhhh, no we won’t. Some people here just don’t get it. Um ya I meant as a rookie. I mean the internet is available to u for you to validate my comments. But evidently you aren’t very bright or just not a big fan because a real buc fan would have known I meant as a rookie. You just assumed I meant in general. 😂😂😂😂. Catch up little boy. Youngest player to reach certain milestones too. Go ahead and Google. It will certainly help u catch up to the rest of us. But you’re a crab leg joke kinda guy. You’re radiating casual fan now. Lame humor and inability to comprehend. But please ignore his accomplishments and tell us about his issues. Or maybe a few crab leg jokes. That was 4 years ago bud what has he done since then? It’s fine I can see you’re a fan who loves to skew numbers into his favor to make something mediocre look better, just as I’m sure you’re the same fan that is content with mediocrity in general. You see nothing wrong with having a No. 1 overall pick for 5 years and still not playing like an elite quarterback while other people who are younger and drafted later surpass him in half the time. And I’m not talking about wins and losses I’m talking about playing quarterback. It’s okay though, I don’t blame you. Our Bucs haven’t won a playoff game since the Super Bowl almost 20 years ago, it’s not your fault you’ve assimilated into this society of thinking 6-10 or 7-9 seasons look “promising” and anything better than that is a “good year”. Ya I wish he did better by now. A lot of us are confident he will be. No I’m not skewing numbers. Funny for you to overlook records like it’s nothing. Lol. And you’re off as far as he’s done nothing since. That third paragraph is just dumb and unfunny. No comment. Bruce arians came here to work with Jameis cuz he likes him as a person and as a player. He’s statistically the third most successful coach in the NFL. Guess he’s got his hands on his sack too. You should totally teach him a thing or two since you know Jameis is a bust and all. Arians came here for millions of dollars, that’s it. The price was the “Hassle King”. Arians gets the money even if Clutsy McFumble doesn’t eat any W’s or if #3 once again decides what he wants is more important than what the women in his life wish to allow. Don’t kid yourself Buccernutter, 5 years showed us that what we’ve got is less than a number one pick or the face of a franchise. It’s quite simple actually……could the Bucs get a number one overall pick if they traded Winston? The answer is obvious. At this point he is not worth the number one pick. You’re right. We’ll see how things go. Insinuating the only reason Bruce is here is because of money is not only wrong but ignorant. I figured this site has mostly die hard fans but man, if you guys are the epitome of our fan base, we definitely have the dumbest in all of sports.